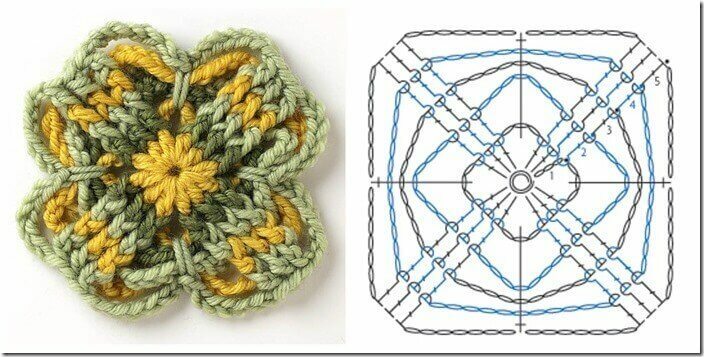 This free motif pattern is a little sneak peek from Edie Eckman’s Connect the Shapes Crochet Motifs. This is one of my favorite motifs from the book. And yes, Storey Publishing has so generously allowed my to share this motif pattern with you all! I hope you enjoy it as much as I do. Add some post stitches for texture and reversibility! This motif is truly reversible, but each side looks quite different – just choose one side or the other as the right side. Even better, put them together for a fabric that looks great on both sides (see Joins on pages 78 and 80). FPdc(front post double crochet)Yarn over, insert hook from front to back to front around post of stitch indicated and pull up a loop, (yarn over and pull through 2 loops on hook) two times. Rnd 1 Ch 3 (counts as dc), 2 dc in ring, ch 3, *3 dc in ring, ch 3; rep from * two more times, join with slip st to top of ch-3 — 12 dc and 4 spaces. Fasten off. Rnd 2 Standing FPdc in first dc of any 3-dc group, FPdc in next 2 dc, ch 7, *FPdc in next 3 dc, ch 7; rep from * two more times, join with slip st to top of first FPdc. Fasten off. Rnd 3 Standing FPdc in first dc of any 3-dc group, FPdc in next 2 dc, ch 9, *FPdc in next 3 dc, ch 9; rep from * two more times, join with slip st to top of first FPdc. Fasten off. Rnd 4 Standing FPdc in first dc of any 3-dc group, FPdc in next 2 dc, ch 11, *FPdc in next 3 dc, ch 11; rep from * two more times, join with slip st to top of first FPdc. Fasten off. Rnd 5 Standing FPdc in first dc of any 3-dc group, FPdc in next 2 dc, *ch 7, working around 4 ch-loops, sc into space from Rnd 1, ch 7**, FPdc in next 3 dc; rep from * around, ending last rep at **, join with slip st to top of first FPdc. Fasten off. Reversible shapes offer all kinds of fun options for connections. In this example, Motif 22 is connected using alternating sides as the “right” side. Just make all the motifs as for Motif 22, but flip the connected piece over as needed to attach each additional motif. And of course, the other side looks just like this! 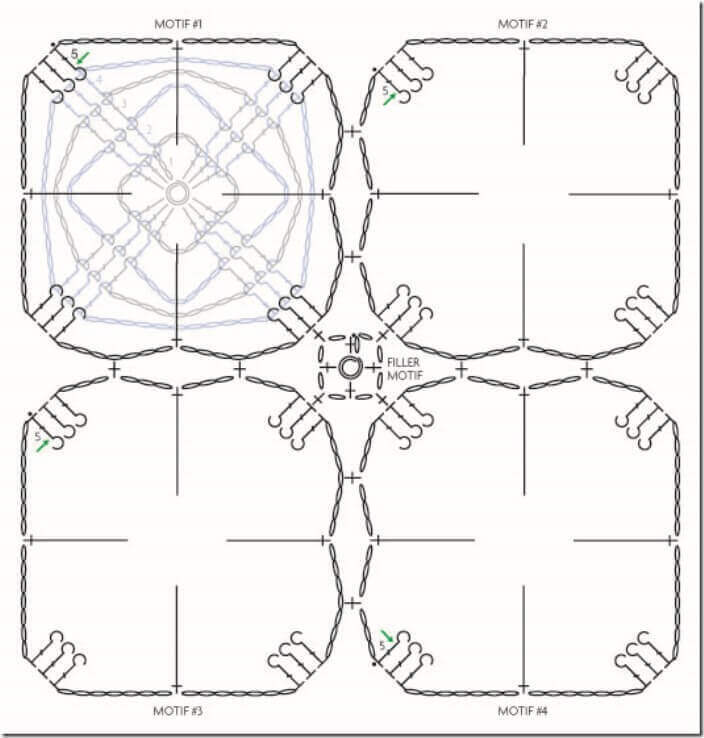 A tiny filler motif connects to each shape and fills the center space. Work the first motif through Rnd 5. Make additional motifs the same as the first motif, joining to previous motif(s) in Rnd 5, by working (ch 3, sc in space of previous motif, ch 3, sc over 4 chs into Rnd-1 space, ch 3, sc in space of previous motif, ch 3, 3 FPdc) across each side to be joined. Ch 1, sc in ring, ch 1, sc in center dc of -interior 3-dc group on any joined motif, ch 1, *sc in ring, ch 1, sc in center dc of next interior 3-dc group, ch 1; rep from * two more times; tighten sliding loop, join with slip st to first sc. Fasten off. Excerpted from Connect the Shapes Crochet Motifs (c) by Edie Eckman, Photography by (c) John Polak, used with permission from Storey Publishing. Love that motif, Kara! You inspire me to pick up my hooks and crochet again! 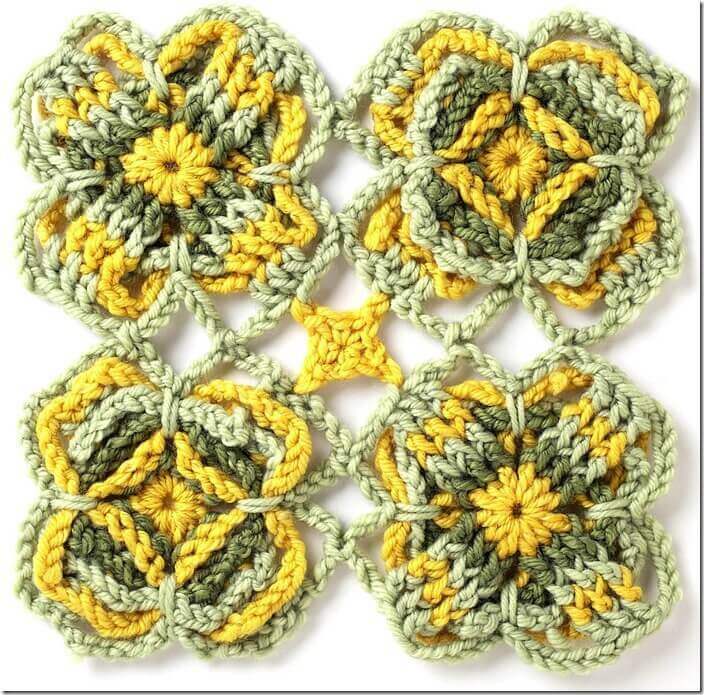 This is a very nice pattern, looks like you could use it in a number of ways, Thank you for sharing. LOOOOVE!! This motif is incredibly full of texture and color play! I love that both sides look incredible yet so different! Thanks for sharing! Lovely motif, thanks for sharing Kara! Hope you enjoy it, Elisabeth!